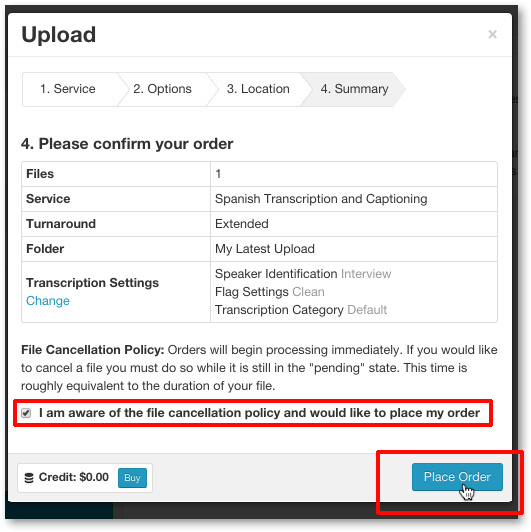 Follow the steps below to upload your Spanish source content directly from your computer to your 3Play Media account for the Spanish (Latin America) transcription service. PLEASE NOTE: Before uploading content it is best practice to check your transcription settings. 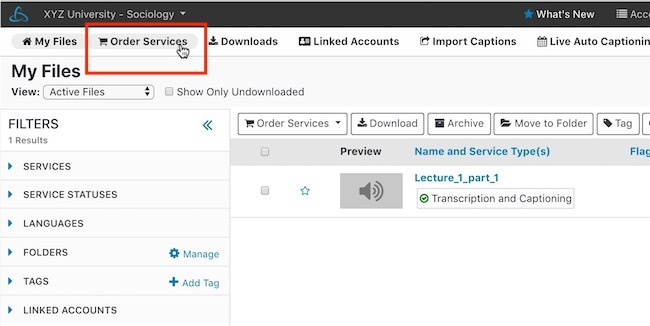 Note that the speaker identification options in transcription settings displays in English but when Spanish (Latin America) Transcription and Captioning is selected, the speaker labels used within your files will be in Spanish. After configuring your transcription settings click Upload on the top, left hand side of the page. Once Upload is clicked you are directed by default to Upload > From Computer. Click Choose Files and select the Spanish source media files from your computer. Upload 8 media files at a time using the direct upload method. After the green progress bar reaches 100% you will be directed to Upload Options menu. From the Service tab select either Transcription and Captioning default service or Alignment. If Transcription and Captioning is selected, choose Spanish-Latin America as the language. Choose Spanish (Latin America) Transcription and Captioning to have a transcript created from scratch using your Spanish source media files (video or audio) as the reference. This service combines a technological approach with human clean up. Upon completion of the transcription process the file will be available for download in a variety of caption and transcript file formats. Choose Alignment > Spanish (Latin America) if you already have a transcript in Spanish (Latin America) that you would like to have synced with a media file where Spanish is being spoken. Once complete the file will be available for download in all of the same caption and transcript file formats as if the media file had been submitted for the default service. Select a turnaround service level for the Spanish transcription and captioning requests. Turnaround options include the Standard four business day turnaround service level, the Expedited two business day turnaround service level, and the Extended 10 business day turnaround service level. The Rush 1 business day and Same Day (8 hours) turnaround service levels are also available however access to these service levels needs to be granted by your account manager after a request has been made directly from your 3Play Media project. When the file is pending a glossary, cheat sheet, or PDF can be attached to give our transcription editors more information regarding your Spanish source content.